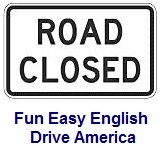 ﻿ Fun Easy English - Drive America - United States of America road signs, rules, and regulations regulatory, management. The regulatory road sign, road closed, instructs traffic that the road ahead is closed or is closed to thru traffic. Management signs are also used in the event of a natural disaster and instruct people where to seek shelter. All traffic is required to stop at the traffic control point ahead. Keep traffic moving quickly but maintain a safe speed. Road use permit is required for road uses who want to continue to travel on the road. Road ahead is closed to thru traffic which means there is no outlet at the end of the road. Road ahead is closed to thru traffic 10 miles ahead which means there is no outlet at the end of the road but local traffic doing business or residing along the road is permitted. Bridge ahead is closed to thru traffic 10 miles ahead which means there is no outlet at the end of the road but local traffic doing business or residing on the other side of the bridge is permitted. Hurricane shelter is located 4 miles to the left. Emergency shelter is located 2 miles to the right. Chemical shelter is located 6 kilometers to the left. Fallout shelter is located 5 miles ahead. Decontamination center is located to the right. Medical center is located to the right. Welfare center is located to the right. Registration center is located to the right.